With both coasts of the U.S. blanketed in snow or rain this week, the call for fashion that can endure the elements has never been more evident. Performance denim brand Duer aims to meet that demand with its new collection of Weatherproof Denim. Described by the brand as “the most technical jean on the market—and one you actually want to be seen in,” Weatherproof Denim boasts a roster of performance attributes designed to replace men’s every day jeans. 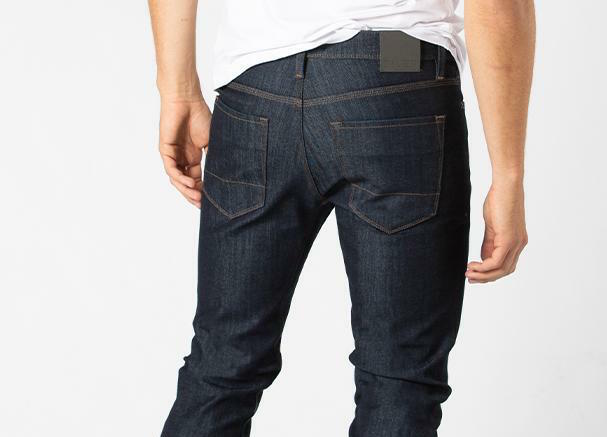 The slim jeans are outfitted with waterproof and windproof membranes that keeps the wearer dry and warm, while a breathable membrane helps regulate temperature on both warm and cool days. The jeans are not 100 percent waterproof, but Duer says the jeans beat the industry’s baselines for moisture wicking and water resistance in fabrics. Duer’s Weatherproof Denim complements the brand’s range of purposeful products, including fleece-lined jeans and Stay Dry Denim, a line of jeans coated with paraffin wax to repel oil, dirt and water. Weatherproof Denim, which retails for $199, is made with Duer’s L2X performance denim, which the brand says is 40 percent more durable and weighs 30 percent less than traditional cotton denim. Additionally, the weatherproof style is designed with an invisible seat gusset for a greater range of motion. For commuters, reflective details under the cuff and waistband provide more visibility and protection in low light conditions.